The Parkers Guide has compiled a list of the top ten must-have features for a company car, so we take a look at the new cars that will tick the boxes. The top ten features are listed below, and are the items of specification Parkers believe are most likely to make life easier for drivers without uncessarily increasing the value of your P11d. It’s incredibly useful to be able to open, close and start your car without using a key. Indeed, some modern cars will even allow you to open the boot without the usual heaving and tugging. This feature is great for businesspeople that use their car for carrying box-loads of work-related products or documents, and simply won’t always approach their car with free hands. Cars with this feature include the brand new Jeep Grand Cherokee and the brand new Mazda 6 Sport model . Search all new cars with Keyless Entry. If you often make business calls from your car and want to keep on the right side of the law, you’ll need a car with Bluetooth that allows you to make and receive telephone calls without touching your phone. Often, your car can even read out text messages to you while you drive. Cars with this feature enabled include the new Kia Pro_cee’d GT and all our top Mercedes-Benz business leasing deals. Search all cars with Bluetooth Connectivity. Again, this is a feature that many drivers find useful, but that those who use their car for work tend to treat as an absolute essential. Today, many cars have navigation that can also inform them of traffic situations and [speak to other cars on the road] to prevent accidents. Sat Nav is available in the new Renault Captur Dynamique Medianav models. Search all cars with Satellite Navigation. If you drive long distances for work purposes, you’re going to want high quality audio to fill your ears with delightful noise. Cars with DAB radios or docking points for iPod/MP3/smartphones are therefore a necessity, such as [the new Vauxhall Adam] or a smart new BMW, usually a good bet for good audio and the first manufacturer to offer live music streaming in-car. Search all cars with DAB radios. If you rely on your car and don’t want to face losing your licence, one useful feature is being able to set a maximum speed, especially during long motorway journeys. Cars with cruise control and speed limiter as standard include the new Peugeot 208 and the new Hyundai i10. Search all cars with cruise control. Losing concentration behind the wheel? A car with lane departure warning will alert you (through noise or vibration) when you appear to be drifting over marked lane lines without indicating. A useful way to check if you’re too tired to drive, and avoid accidents. Check out the new Citroen C4 Picasso or new Vauxhall Cascada if this is a feature that interests you. Search all cars with lane departure warning. Generally, the blind spot warning consists of a flashing light on or near your door mirrors, to alert you to traffic coming up behind you that you may not have noticed in your blind spot. Another handy way to avoid accidents on motorways. You can get blind spot monitoring in the new Chrysler 300c and in a wide range of new Ford models, including the Focus, C-MAX, Kuga, Mondeo, S-MAX and Galaxy. If you are using your car to travel to new places a lot, parking assistance could be a useful tool. Unfamiliar parking spaces can be a nightmare, and with parking assistance you will get a warning (lights or noise) if there is anything you are about to hit when parking – protecting your car from damage. What would be even better would be a car that parked itself, but let’s not get ahead of ourselves. Search all cars with parking sensors. As if parking in city centres wasn’t hard enough, driving around where people can leap out in front of you is something else to consider when selecting additional options for your company car. Emergency city braking gives your car the ability to stop itself when required, reacting much faster than a human would. Reduce damage to your car or avoid it altogether. Available in the new Ford Fiesta and the new Volkswagen Golf. Very few cars these days come sans air conditioning, but proper climate control kit in your company car allows you to set precise temperatures and configure the optimum settings to keep you and your passengers perfectly comfortable. If you can, opt for seats that heat and cool nervous business bottoms – you’ll thank yourself. Search cars with climate control. 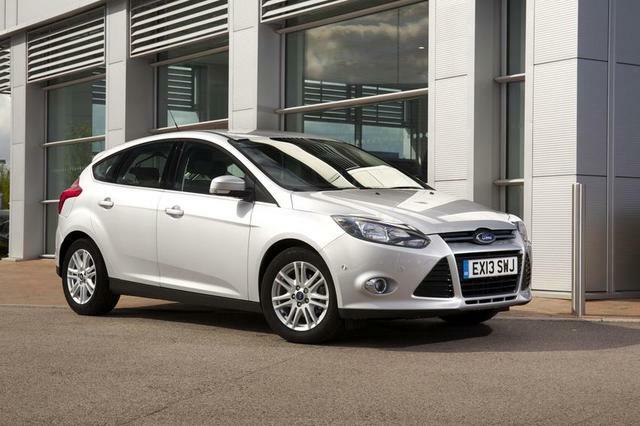 With five of these ten features, Ford believes the Ford Focus is the ultimate company car. Their press release says: "The new Ford Focus Titanium Navigator comes with five of the 10 options fitted as standard, and is available to order now with the ‘International Engine of the Year’-winning 1.0-litre EcoBoost. With all 10 options selected – at an all-in, 40% benefit-in-kind payment of £83.37 per month – the Ford Focus is the ideal company car." View our best business deals at business.arnoldclark.com.